Outdoor Products Innovations (OPI) is a forward-thinking company ready to make your customer’s outdoor experience safer, more enjoyable, and more successful. Founded in 2015, by current President and CEO Dan Reaser Sr., Outdoor Product Innovations, Inc. is making waves in the outdoor industry. How exactly? Simple: The company prides itself on making top-quality, premium products for the hunting, fishing and outdoor industries. Couple those innovative products with exceptional customer service, and you have an instant recipe for success. And while the outdoor markets, in some respects, seem to be experiencing somewhat of a downturn, OPI continues to flourish. One of OPI’s strongest brands, and one more and more outdoorsmen are finding themselves in each fall and spring, is their massive line of hub-style blinds. Dubbed Rhino Blinds, this impressive lineup offers ground blinds in an array of sizes and price options. AB: What Rhino Blind features stand out from other hub-style blinds on the market today? DR: From the small, spring steel Rhino-50 to the oversized hub-style Rhino-600, Rhino Blinds have you covered. Our blinds offer the No. 1 fabric used on ground blinds in the hunting industry. All Rhino Blinds utilize wet printed fabric, meaning they will have a smoother, duller finish and hold up to fading much longer than other ground blinds on the market. In addition to the killer fabric, we also offer hook-and-loop windows, and every hub-style blind we produce includes an oversized, zipper-less door. 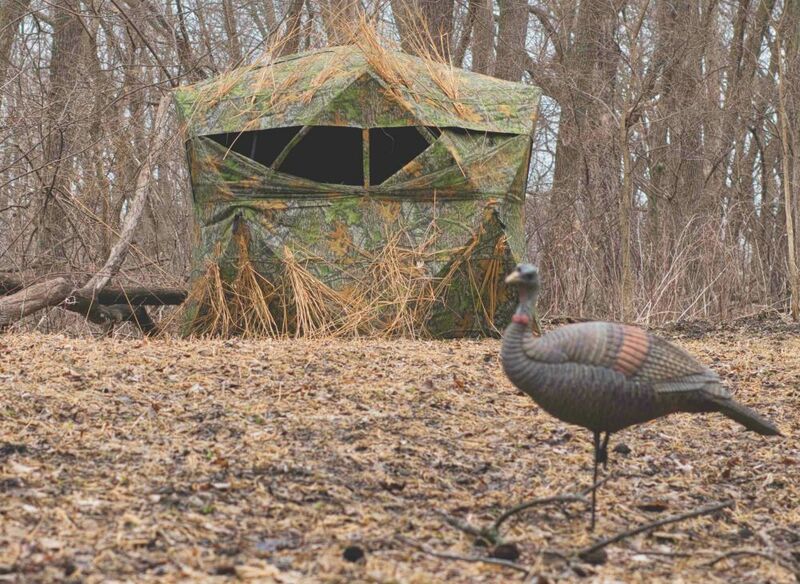 This design makes for a silent, stealthy approach when ground blind hunting. All hub-style Rhino Blinds include brush-in straps around the entire top and bottom of the blind, allowing the hunter to add natural vegetation and on-the-ground debris to the blind. We also carry a full year-round inventory, making it easy and stress-free for retailers to reorder and restock at any time. Measuring 75 inches by 75 inches, the durable five-hub Rhino-150 features zipper-less entry and exit, and holds up to three hunters. Tipping the scales at just 18.6 pounds, this 66 inch at-center-height blind showcases brush loops for adding natural cover, and includes a backpack, stakes and tie-down ropes. At just $140, the Rhino-150 is an economical choice that is loaded with purposeful features. AB: How do the features of Rhino Blinds benefit the retailer? DR: The many features of our Rhino Blinds benefit the retailer in the fact that they make selling a ground blind easier than ever before. The Rhino Blind brand represents top quality and durability, two factors that are a must-have when it comes to ground blinds. Customers aren’t going to be bringing these blinds back and complaining about them. Rhino Blinds are tough, incredibly durable and are really easy to set up. This allows the retailer to sell our blinds at a higher price, creating more margin and cash in their pockets than any other ground blind in the industry. Hitting a sweet-spot price point of $80, the Rhino-75 Spring Steel Blind features shoot-through mesh windows, and is an ideal choice for a single ground blind hunter. 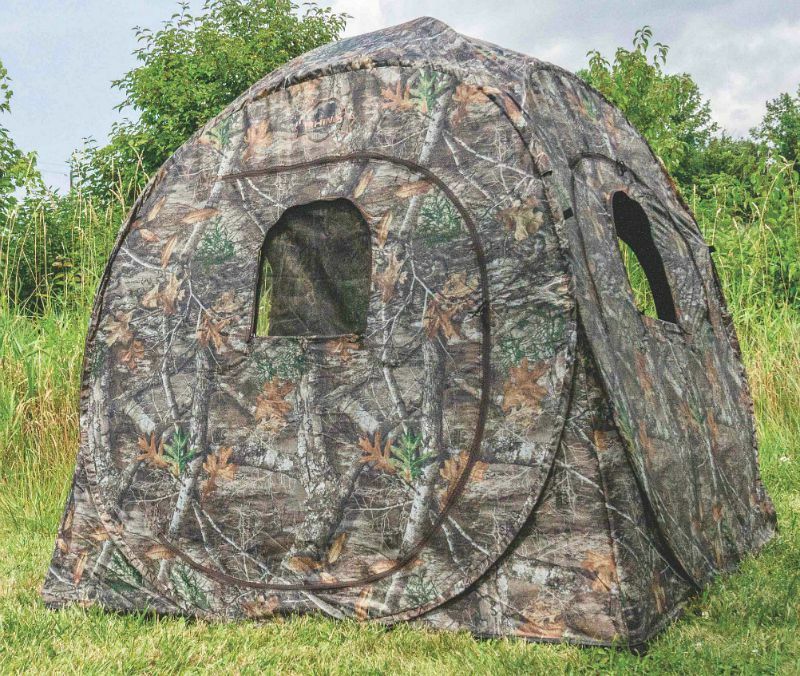 Smaller in size, this blind is perfect for those who prefer to pack deep into public tracts. AB: Not many ground blind manufacturers offer replacement parts. How has doing this been received by the retailer? DR: We want the retailer and customer to know that if they choose Rhino Blinds, not only will they receive a premium ground blind, but they will also receive top-of-the-line customer service to go along with it. This includes making sure that replacement parts are available at all times for any issue that may pop up. This is being received extremely well by our dealers, retailers and customers. Our many dealers and retailers use this as an additional tool to help close the sale. 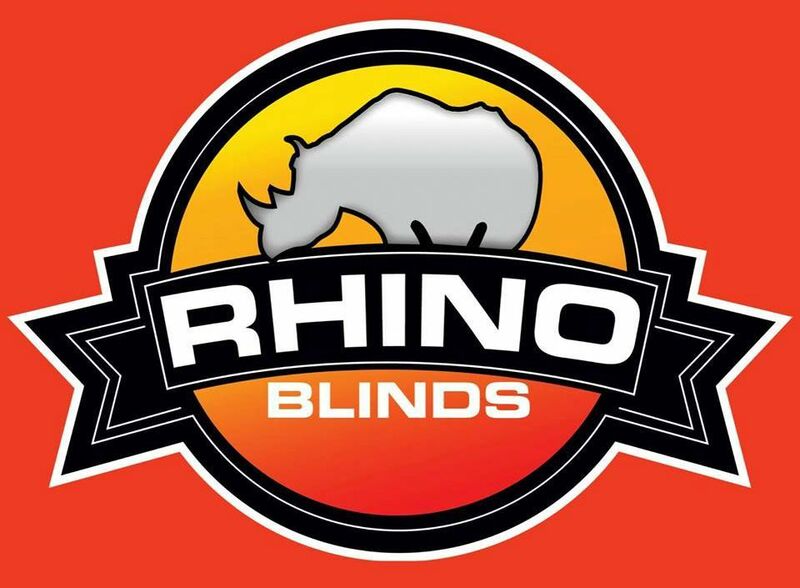 Check out the short video below for a more detailed look at Rhino Blinds. AB: Feeders are a big deal in the whitetail world. Tell me about the design of your Capsule Feeders and how they work. DR: Capsule Feeders, in our opinion, are the No. 1 solution to safe and easy game feeding. Our patented, auger-driven technology allows the customer to fill their feeder while standing on the ground or sitting on the tailgate of their pickup or UTV. No more climbing ladders or standing on the top of your ATV or truck to fill a shaky tripod feeder. Having to balance on the tailgate of a truck or climb a ladder while handling a heavy bag of feed just isn’t a good recipe for safety. With our Capsule Feeders, the feed of your choice is brought up from the ground by a durable auger and then thrown in a 40-foot radius. With a 200-pound feed-holding capacity, the 200# Capsule Feeder’s patented ground-sitting capsule design eliminates the dangers of working under a 400-pound barrel of feed, as well as the dangerous act of climbing a ladder or trying to balance on the side of truck bed in effort to fill a standing tripod feeder. The sit-and-fill design boosts overall safety and ease-of-use. The HDPE structure of the capsule is easily moveable, lightweight and specifically designed to withstand seasons of rugged abuse. The feeder’s low center of gravity prevents animals from knocking it over, and its included solar panel allows you the ability to simply set it and forget it. AB: What makes the Capsule Feeder stand out from other feeders currently available on the market? DR: We think it’s the fact that they are 100 percent varmint proof, and are easy to fill right from the ground. With a Capsule Feeder, gravity is your friend. The Capsule Feeder is available in multiple capacities, from 100 pounds all the way up to 1,000 pounds, and everything in between. We just have so many SKUs available. This allows the retailer to sell a Capsule Feeder to both the small-acre hunter and the large-ranch farmer. All Capsule Feeders include everything the customer will ever need to run his or her feeder. This includes a 12-volt motor, solar panel, timer and varmint cage, just to name a few. 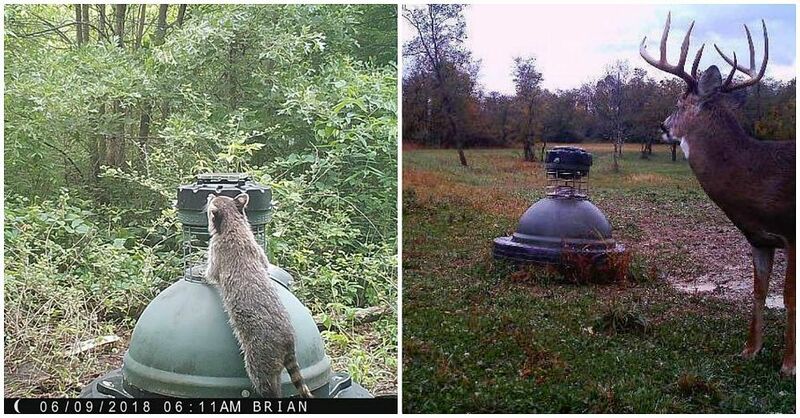 Capsule Feeders work great on whitetails, and prevent unwanted animals from accessing the food. AB: How has the Capsule Feeder been received? DR: Capsule Feeders have been received very well all across North America. 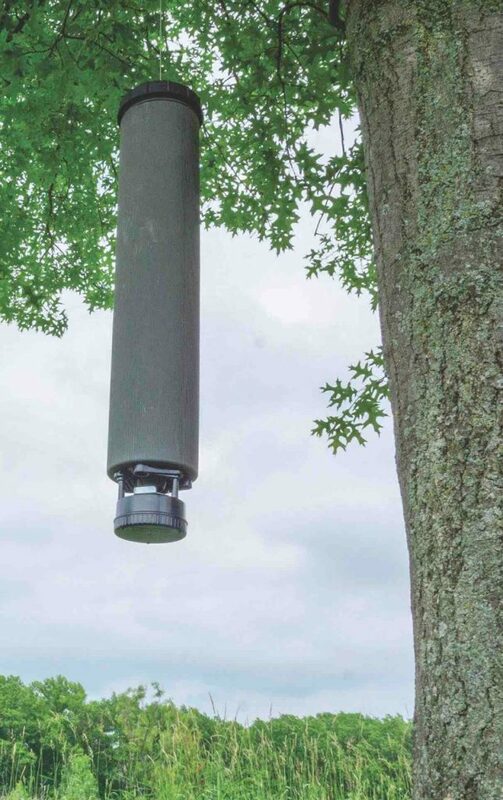 The fact that there is finally a feeder on the market that will stand up to pesky raccoons and squirrels, as well as one that is completely safe and reliable, has had the market buzzing. We are the only game feeder with a 100 percent satisfaction guarantee. You won’t find many more outdoor companies as diversified as OPI when it comes product-line diversity, and its LiDCAM is a shining example of this. With capturing hunts via video being all the rave, OPI saw yet another opportunity to bring a high-quality self-filming device to the market. AB: Filming hunts and other outdoor adventures is growing in popularity. Tell me about the LiDCAM. What separates the LiDCAM from other self-filming devices out there? 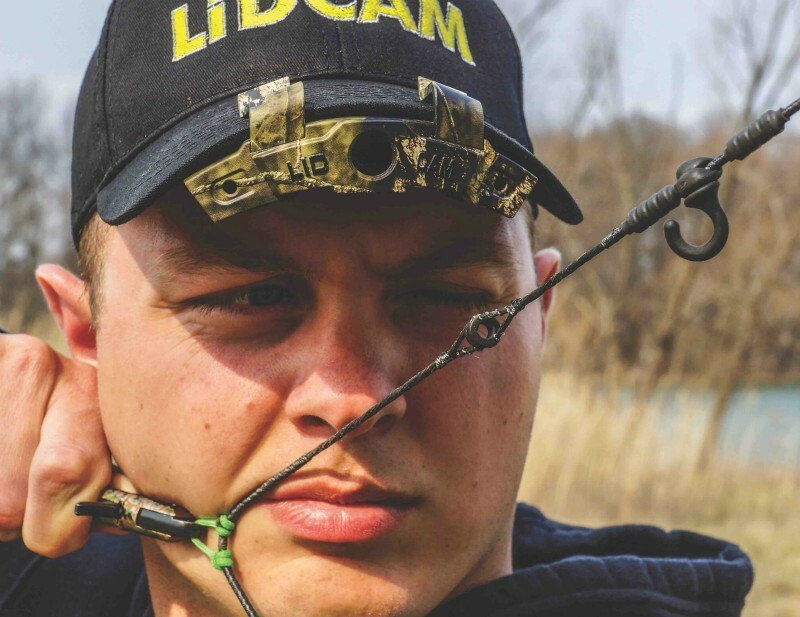 DR: The LiDCAM is the hands-free solution to easily filming your own outdoor activities and experiences. The LiDCAM is a high-definition action camera that clips right to the bill of any cap, and it shoots in full 1080p HD video with clear audio. This has been a game changer in the self-filming world. Guys and gals, because the unit attaches to the cap and offers hands-free operation, are able to capture their outdoor moments and then take those moments and create short movies for YouTube, social media platforms and the like. It also provides another camera angle for those who are filming their hunts for television. It’s just a great all-around product and one we are really, really excited about. The LiDCAM is lightweight and simple to use. All you need is a baseball cap! How can you beat that? Featuring a built-in Lithium Ion battery that offers 3 hours of record time, this simple clip-to-your-cap unit makes self-filming your outdoor adventures easier than ever. The LiDCAM+ with Wi-Fi retails for $160, sports a wide-angle lens, records in full 1080p HD video with full audio and connects directly to your smartphone. AB: Tell us about the LiDCAM App. What benefits does it provide? DR: At the beginning of 2018, we launched the all-new LiDCAM+ Wi-Fi model, which includes built in Wi-Fi connectivity that allows the user to control their LiDCAM and view/save recordings right from their smartphone. The app is very user friendly and complements using the LiDCAM very well. Basically, the app makes the process of self-filming all the easier, being that the user can control the LiDCAM completely from their phone. Weighing only 20 pounds, the Rhino Outpost Feeder is ideal for the on-the-go-bowhunter. The hanging unit can hold up to 25 pounds of feed. AB: Tell us about the future of OPI. What plans, that you can reveal, do you have moving forward? DR: OPI aims to always be ahead of the game when it comes to new and innovative products. We are excited to see what the remainder of 2018 brings for us, and can’t wait to share with everyone what we have in store for the years to come. One thing we can share is a new and exciting product that we just added to our umbrella of great outdoor innovations; it’s called the Rhino Outpost Feeder. The Rhino Outpost Feeder is the clear choice for hunters on the move. Holding up to 20 pounds of feed and weighing only 25 pounds completely full, the patented cylinder-shaped Outpost Feeder is easy to carry deep into the woods. The included carrying bag makes moving the feeder simple and convenient. This small price-point feeder ($99.99) and its patented cylinder design allows the feeder to fit in a bag similar to the size of those bags you see fold-up lawn and travel chairs come in. 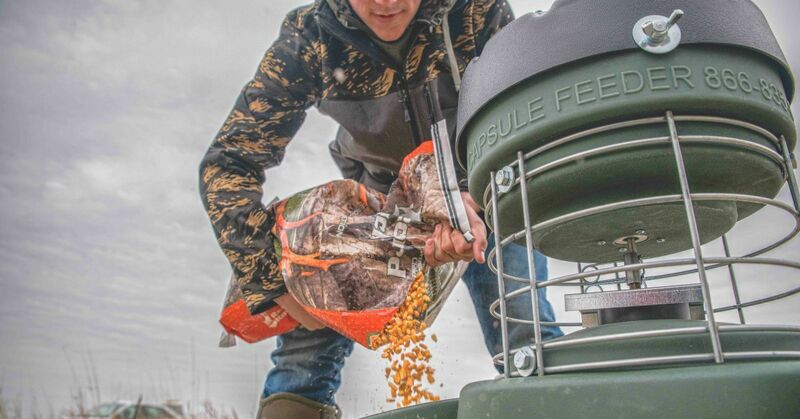 Guys and gals are going to be able to haul this feeder with them wherever they go with ease. The color of the feeder and the detail it showcases makes it look like a small oak tree. This really helps the feeder to blend in to the environment. Those that hunt public land where baiting is legal or even gain private permission that is not necessarily exclusive are going to appreciate the design, and the fact that other hunters are likely to walk right by it because it blends into the woods so very well. 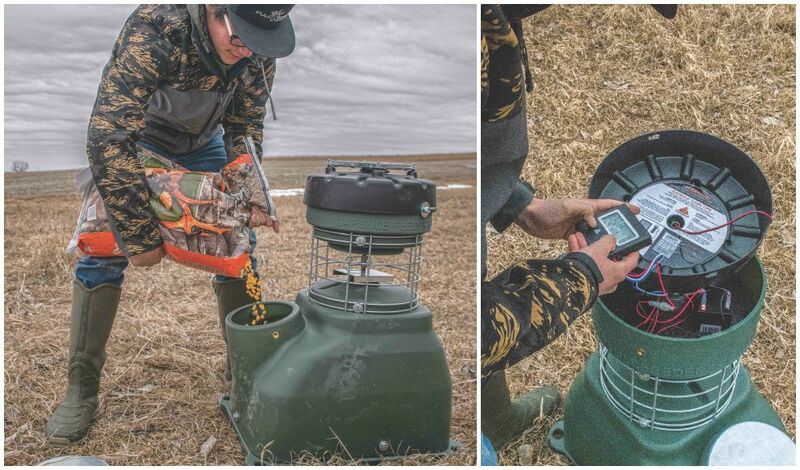 Plus, because those who hunt public land and private tracts that other hunters can access often like to venture off the beaten path, they will no doubt appreciate how easy it is to tote this feeder. For more information on Outdoor Product Innovations, click here.